(4th from left) Abdul Hadi Bin Che Man, Director of Tourism Malaysia in HCMC; AirAsia Captain Rajesh Gill; Dương Tấn Hiển, Vice Chairman of Can Tho People’s Committee; Phạm Thanh Tâm, Director of Can Tho International Airport and Nguyễn Minh Tuấn; Deputy Director of Can Tho Department of Culture, Sport and Tourism receiving AirAsia’s inaugural flight at Can Tho International Airport. 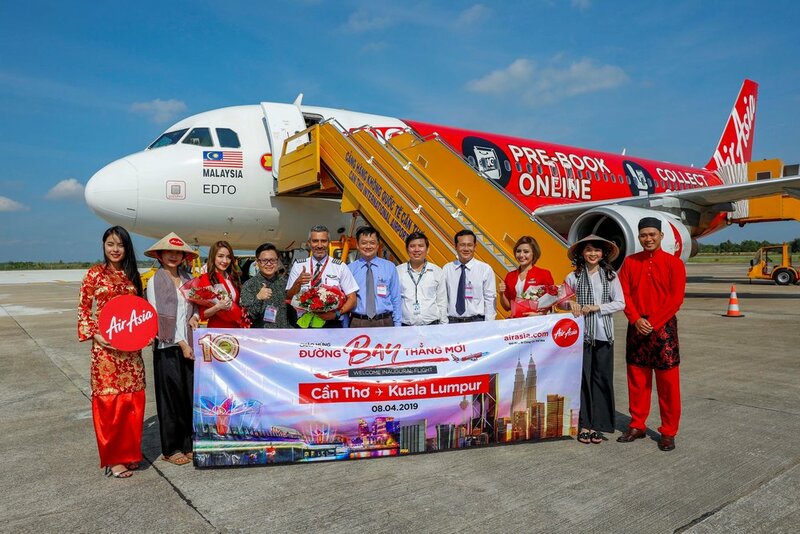 Can Tho, 08 April, 2019 - AirAsia celebrated its first flight from Kuala Lumpur to Can Tho today, making history as the first international flight to touchdown in the Mekong Delta’s largest city. Can Tho becomes AirAsia’s sixth destination in Vietnam, and follows the announcement of new services between Bangkok and Can Tho which are set to commence in May 2019. Ms. Laddawan Meesupwatana - Group Head of Product, Indochina Market said: “We are excited to welcome the first-ever international flight to Can Tho today. The Mekong Delta has tremendous potential with some 8.5 million visitors choosing to come here in 2018.